What do they make? Socks. An individual pair of socks is $15, or you can get a set of three for $45. What do they do? 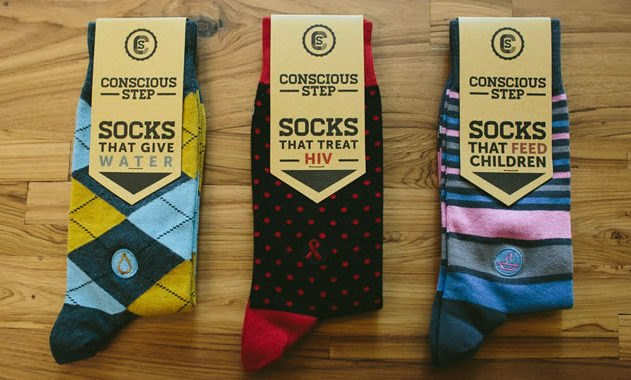 Each pair of socks purchased equals one donation to one of their several charities. Their causes cover a wide range, including rainforest conservation, disaster relief, children’s education, poverty, hunger, environmental initiatives, ocean preservation, and HIV treatment. Why support? This company is incredibly transparent about their production process and supply chain. They support small and marginal cotton farmers, partnering with them and additional organization to manufacture and design their socks. Each of their manufacturing partners is dedicated to maintaining a fair and ethical workplace and world. For more information about Conscious Step’s story, see their website.